Ah, Siri Hustvedt. Even before I’d read a single page of Hustvedt’s work, I was already slightly terrified of her reputation of being insanely brilliant and intelligent (not to mention one half of another equally brilliant and prolific writer). Of course, it’s sad when an author and the book’s reputation outstrips the work itself so I pushed it all out of my mind when I began the first page. [Some necessary SPOILERS in the review]. What I Loved begins fundamentally as a memoir written by an aging New York art historian, Leo Hertzberg. It is a story about love and lovers that begins in the 1970s – the romance between Leo and his wife, Erica, and the tangled relationship between Leo’s best friend, Bill, his wife Lucia and his lover, Violet. The friendship and bond between Leo and Bill is especially endearing and powerful. Initially intrigued and attracted to peculiar pieces of art created by Bill, Leo seeks him out and the two men connect. Art forms the basis of their friendship: Leo is a prolific art historian and academic teaching at an Ivy League university while Bill slowly builds up his reputation as an avant garde artist. The pieces that attracted Leo were a series of self-portraits of Bill – except that it featured a beautiful woman, a bewitching model named Violet. As Bill struggles to maintain his marriage with his wife, Lucia, a reserved and cold poet (is this an oxymoron? Can a poet ever be cold? ), Leo and Erica, a literature professor, revel in theirs. Soon enough, babies are on the way. Both Erica and Lucia have their pregnancies at the same time, only a few months apart and both babies are boys. Erica and Leo name their son Matthew and Lucia and Bill name theirs Mark. Time goes by and the two boys take their first steps, ride their first bikes, lose their first tooth, begin their first day of school. The two families live in the same apartment building, one floor apart, and spend their summer vacations together. Without giving everything away, the story begins to turn when the boys are ten years old and Matthew is taken away. Leo and Erica are left devastated and everything in their lives changes as they struggle to get through their loss. Throughout his childhood, Mark had been a placid, quiet and agreeable boy. Now a teenager, Mark has become a charismatic man, able to read the room and its people, but still retaining his placidity which now prevented anyone from reading the ‘real’ Mark. Falling into a questionable crowd, and with the love of the nightlife and alternative lifestyle, Mark falls under the influence of a self-proclaimed provocative and narcissistic artist named Teddy Giles. Giles creates sadistic and violent art to mock and caricature the media and society’s obsession with violence although the art doesn’t sit well with Leo. As Mark gets further entwined with Giles, and with his uncanny ability to lie and increasingly creepy placidity, the more Leo, Bill and Violet lose him. What I Loved contains so many streams that one brief review could never cover. It is four stories/themes in one: it is a musing on the question of what constitutes as art; a story about family; a psychological thriller; and finally, a story about love and loss. Mark is one of the most intriguing and infuriating characters I have ever met, at once both sinister and pitiful largely due to early childhood trauma but he is largely frightening towards the end simply because of our inability to ‘read’ him. Hustvedt’s writing is intense and you know that she’d poured her entire being into this novel. I simply felt exhausted when I finished this! But this is one amazing novel. 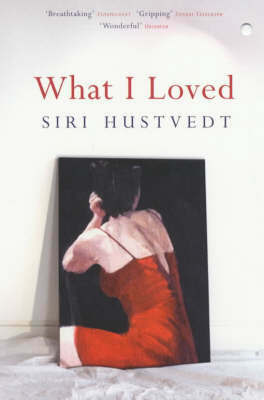 Everything felt so real, particularly the artworks that Hustvedt describes. If they were actual artworks, I would be running to see them. The book’s timeline spans over twenty-five years and Hustvedt’s writing makes the time flow by seamlessly. Everybody grows and yet, you don’t feel like you’ve missed anything in the characters’ lives, particularly anything crucial. When I first began reading this book, I thought far too much about it but I just recommend that you bunker down somewhere (like I did at the airport and plane) and go for it. Let it wash over you and simply absorb it all in. At first I was very confused about what or who Mark represented. Was he some sort of psychotic villain? Was his childhood so traumatised by his parents’ separation and constant abandonment by his parents? Of course, that played a crucial part but it finally hit me what Mark ultimately represents. Hustvedt is sly (or maybe I’m just slow). Mark’s uncanny, and very creepy, way of presenting the face each person wanted to see in him makes him a blank canvass. He is literally a walking blank canvass. He has no personality, or if he does, nobody has seen it and is kept down deep within Mark. We project our likes and dislikes, hopes and fears onto Mark’s blank canvass and in return, he reflects something pleasant and pleasing to us. We make our own art.